In both North America and Europe, views of the North Atlantic Treaty Organization (NATO) have generally improved over the past year. Today, roughly six-in-ten Americans hold a favorable opinion of the security alliance, up from just over half in 2016, according to a new Pew Research Center survey. Majority support for NATO has also strengthened in Canada, Germany, the Netherlands and Poland. And after a steep decline a year ago, most French again express a favorable view of the security alliance. Improved opinion of NATO comes on the heels of a U.S. presidential campaign in which then-candidate Donald Trump called NATO “obsolete” and raised doubts about whether the U.S. would honor its commitment to come to the defense of its NATO allies. Since taking office, President Trump has voiced support for NATO. 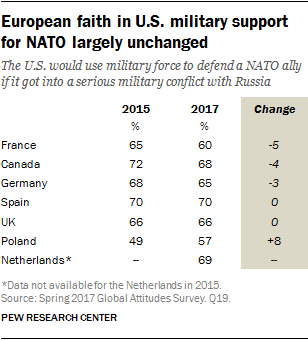 But despite such swings in how NATO has been characterized by the current U.S. administration, most Europeans remain confident that Washington is committed to the principle of mutual defense. Asked specifically whether the U.S. would use military force to defend a NATO member if attacked by Russia, majorities in each of the countries surveyed believe they would. Behind the overall uptick in favorable views of NATO, there are sharp political and partisan differences in how publics in member countries perceive the alliance. 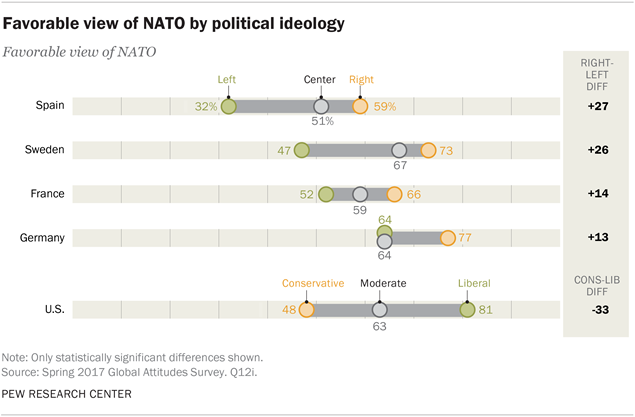 In the U.S., for instance, liberals (81%) are much more supportive of NATO than conservatives (48%). In fact, American liberals’ opinions of the alliance have improved 23 percentage points since 2016. Conservatives’ views are unchanged. In several European countries, those on the ideological right are more likely than those on the left to support the alliance. In Spain, the right and left are 27 percentage points apart – 59% vs. 32% respectively. In Sweden the ideological gap is 26 points, in France 14 points, and in Germany 13 points. The share of the French right with positive views of NATO has grown 14 points in just the past year, while the opinion among the German right is up 13 points over the same period. Despite candidate Trump’s suggestion that U.S. willingness to defend an ally might be conditional on their level of defense spending, a median of 66% in seven nations surveyed believe Washington would use military force to defend a fellow NATO partner if it was involved in a serious military conflict with Russia. For their part, a solid majority of Americans say the U.S. should militarily defend a NATO ally if embroiled in an armed conflict with Russia. Asked about their own country’s obligation under the same scenario, more than half in the Netherlands (72%), Poland (62%), Canada (58%) and France (53%) support living up to their mutual defense commitment as a member of NATO. Just 40% of Germans back such assistance. In most countries surveyed, the more people perceive Russia as a major threat, the greater their willingness to come to a security partner’s defense. These are among the key findings of a new Pew Research Center survey, conducted among 9,761 respondents in the U.S., Canada, France, Germany, the Netherlands, Poland, Spain, Sweden and the United Kingdom from Feb. 16 to April 10, 2017. The North Atlantic Treaty Organization was founded in 1949, and it has grown from its 12 founding members to 28. Its original mission was mutual defense in the face of a military threat from what was then the Soviet Union and its Eastern European allies. Today its mission is broader and includes counterterrorism and cybersecurity. Roughly six-in-ten Americans (62%) hold a favorable view of NATO. Such sentiment has improved 9 percentage points in the last year. This represents the strongest U.S. support for the transatlantic security alliance in recent years. But Americans’ views of NATO are partisan and have been so for some time. Since 2009 Democrats have generally voiced a more positive opinion of the transatlantic alliance than have Republicans. 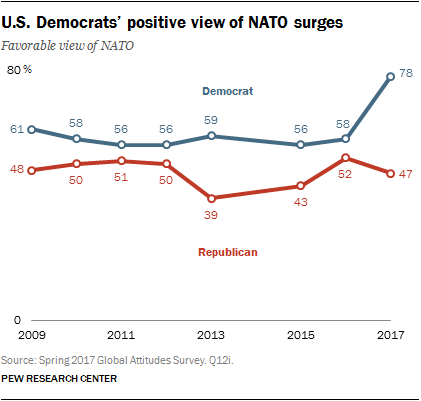 In 2017, 78% of Democrats expressed support for NATO, up from 58% in 2016. At the same time, Donald Trump’s criticism of NATO resonates with his political base. Less than half of Republicans (47%) hold a favorable view of the alliance. The current 31-point partisan divide over NATO compares with only a 6-point gap in 2016. There are no significant generational or gender differences in views of NATO among Americans. But people with a college education or more (68%) are more favorably disposed toward the alliance than are people with a high school education or less (57%). Support for the transatlantic security partnership is similar in Canada, the other North American member of NATO. Nearly two-thirds of Canadians (66%) hold NATO in high esteem. Such support has improved by 10 percentage points since 2015. This rise in support can be seen across demographic groups. Roughly three-quarters of Liberal Party (75%) and Conservative Party (74%) adherents have a positive view of the security alliance, as do about two-thirds of New Democratic Party (65%) loyalists. In Europe, the Poles (79%) and Dutch (79%) express the strongest support for NATO among the alliance members surveyed. In 2015 such sentiment stood at 74% in Poland and 72% in the Netherlands. Two-thirds (67%) of Germans also hold a positive opinion of the security pact. Such support is up 12 points from 2015, in part due to a sharp increase in support by women and an improvement in the alliance’s image in both eastern and western Germany. Germans who have a favorable view of the ruling Christian Democratic Party and the Social Democratic Party are particularly supportive of NATO. Those who have a favorable view of the Left Party, which wants Germany to pull out of NATO, are less likely than the general population to view the alliance favorably. Six-in-ten people in France (60%) voice a favorable opinion of the alliance. Such backing is up 11 points from 2016 but down 11 points from 2009. Those who today have a favorable view of the centrist En Marche, President Emmanuel Macron’s new political party, and the conservative Les Republicains are particularly supportive of NATO. A similar proportion of the British (62%) see NATO in a positive light. And such sentiment has not changed much since 2009. British who favor the Conservative Party and the Liberal Democrats are particularly positive about NATO. And British men (67%) are more favorably disposed toward the alliance than women (56%). Article 5 of the North Atlantic Treaty, which created NATO in 1949, commits member countries to come to the assistance of a fellow NATO member if that ally is attacked. When presented with a scenario in which a NATO member state is attacked by Russia, roughly six-in-ten Americans (62%) are willing to use military force to come to their ally’s defense. Such support is up 6 percentage points since 2015. Men (67%) are more willing to do this than women (57%). And Americans ages 50 and older (68%) are more supportive of such action than those 18 to 29 (57%). Today, there are no partisan differences on living up to America’s Article 5 commitment. But in 2015, the last time Pew Research Center asked this question, Republicans (69%) were far more likely than Democrats (47%) to back aiding allies in a confrontation with Russia. Since then, such Republican sentiment, now at 65%, has not changed much. Democrats’ willingness to offer military support (63%) has increased 26 points. A separate Pew Research Center survey in January 2017 also found that for the first time since 2005, more Democrats than Republicans saw Russia’s power and influence as a major threat to the U.S. And Democrats’ concern about Russia rose 30 points from 2016 to 2017. Germany has the fourth-largest defense budget in NATO, but just 40% of Germans believe that Germany should provide military force to defend a NATO ally if it is attacked by Russia. More than half (53%) do not support such aid. There are no significant partisan differences on this issue among Germans. 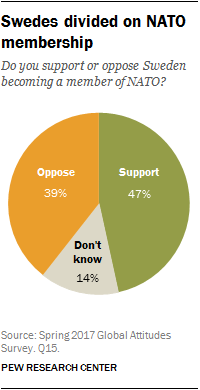 Opposition to providing military assistance is particularly strong among German women (62%). Men there are largely divided on the issue. Among people who live in the states that comprised the western Federal Republic of Germany, 43% think Berlin should come to the aid of a NATO ally. Just 29% of those from the eastern states that were once the German Democratic Republic agree. In Poland, the NATO member state in the survey in the closest proximity to Russia, 62% of the public backs using military force to defend a NATO ally. Such sentiment has increased significantly since 2015, when 48% wanted their nation to come to an alliance country’s defense. In Spain, 46% say Madrid should support a fellow NATO member in a conflict with Russia. Those who have a favorable view of the left-wing, populist party Podemos are much less likely to support helping NATO allies (37%) than those who are unfavorable towards Podemos (52%). Majorities of those who favor the other three major parties – the Spanish Socialist Workers’ Party, the People’s Party and the Citizens’ Party – support coming to an ally’s aid. 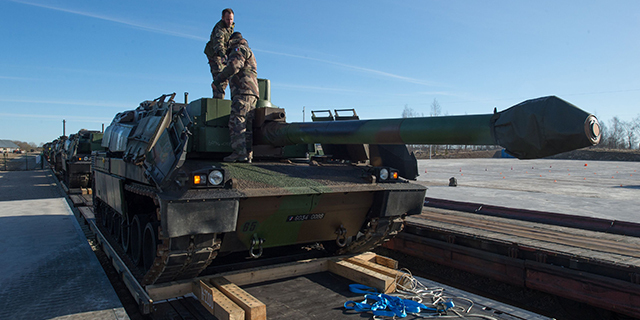 More than half the French public supports their Article 5 obligations: 53% would come to the military assistance of a fellow NATO member, up from 47% in 2015. Older people and those on the left are now more supportive of helping an ally in a confrontation with Russia than they were in 2015. The Dutch voice the greatest willingness among Europeans surveyed to live up to their NATO mutual defense commitment. Roughly seven-in-ten (72%) say their country should come to others’ military aid in a conflict with Russia. About six-in-ten Canadians (58%) support using military force to help defend a NATO ally attacked by Moscow. Fully 68% of Conservative Party supporters say Ottawa should back its allies, but only 54% of New Democratic Party adherents agree. Canadian men (63%) give significantly more backing to using military force in such a situation than do women (53%). Public support for living up to the Article 5 commitment is generally much stronger among those who believe Russia is a major threat to their country, compared to those who say Russia poses no threat. A median of 44% of those in countries surveyed see Russia as a major threat to their nation, including 62% of Polish, 47% of Americans and Spanish, 45% of French, 44% of Dutch and 43% of British. Seven-in-ten Americans who view Russia as a major threat support defending a NATO ally. Only 42% of those in the U.S. who say Russia is not a threat back such assistance. About half of Germans and British who call Russia a major threat to their country voice the view that their country should come to the aid of a NATO ally if it is attacked by Russia. Only about a quarter of Germans and British who say Russia is not a threat support such action. Majorities in all the NATO member countries surveyed believe the U.S. would use military force to back up an alliance partner if it got into a serious military conflict with Russia. This includes 70% of Spanish, 69% of the Dutch, 67% of British and 65% of Canadians. Such sentiment has not changed much in the past two years. Although Sweden is not a NATO member, joining the alliance has been a major topic of recent public debate in that country. About half of Swedes support NATO membership, and such sentiment is largely unchanged from last year: 47% in 2017, 45% in 2016. Opposition to joining has also stayed about the same, with 44% opposing membership in 2016 compared to 39% in 2017. About one-in-seven Swedes (14%) voice no opinion on membership. Swedish men (51%) are more supportive of joining the transatlantic defense community than are Swedish women (43%). Those who favor the Moderate Party and the Sweden Democrats are more likely than others to back NATO membership. Those who favor the Social Democratic Party are less likely than others to back joining the alliance.